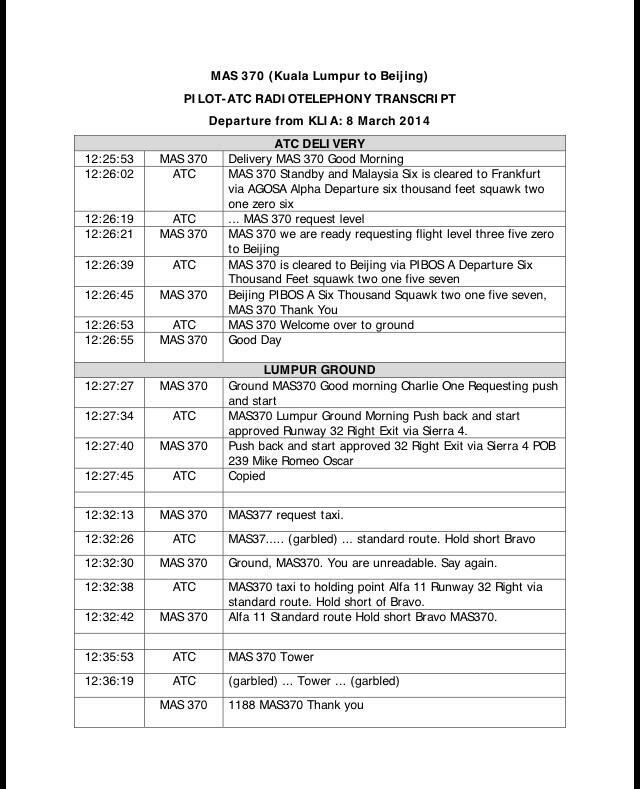 The Malaysian authorities have released the transcript of the final communications between air traffic control and missing Malaysia Airlines flight MH370 and say “there is no indication of anything abnormal”. The transcript has been provided to relatives of those on board the missing plane. 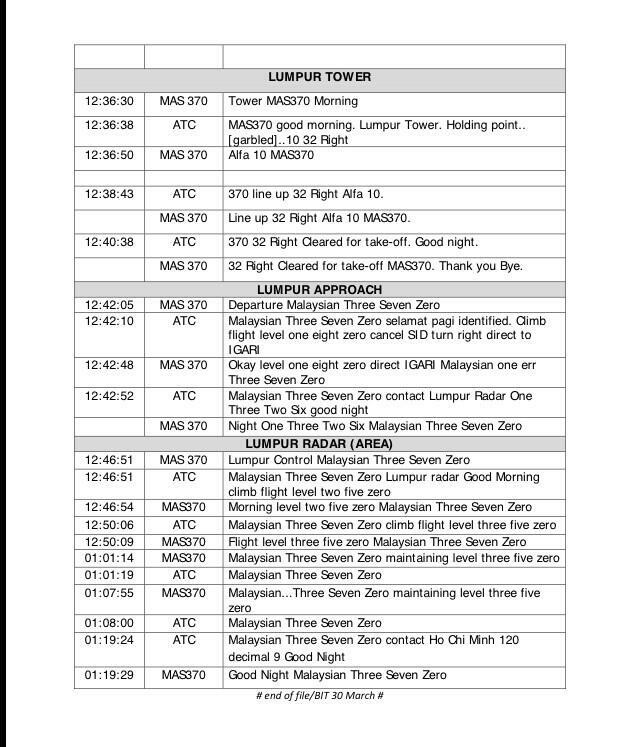 This comes after it was confirmed yesterday that the final words heard from the cockpit were not “All right, goodnight” as was stated earlier, but “Goodnight Malaysian three seven zero”, which is standard aviation terminology. Journalist James Chau from CCTV had already broken the news about the cockpit sign-off when the authorities finally decided to release the communication transcript. The authorities are still conducting a forensic investigation to determine whether those last words from the cockpit were spoken by the pilot, Captain Zaharie Ahmad Shah, or the co-pilot, First Officer Fariq Abdul Hamid. The international investigations team and the Malaysian authorities remained of the opinion, Mr Hishammuddin said, that, up until the point at which it left military primary radar coverage, MH370’s movements were “consistent with deliberate action by someone on the plane”. The authorities believe someone deliberately turned the plane around from its charted course, and turned off the Aircraft Communication Addressing and Reporting System (ACARS) and the plane’s transponder. It is satellite pings from the aircraft to the company Inmarsat that led the investigators to conclude that the plane flew on for about six hours after the Malaysian military last picked it up on radar at 02.15 on the morning the flight disappeared. Analysis of these pings led the authorities to focus their search in the southern Indian Ocean, where the plane is believed to have gone down. Did the plane crash or not? Malaysia’s prime minister, Najib Razak, is to travel to Australia tomorrow. He’ll go to the search coordination centre at the Pearce air force base in Perth to see operations at first hand, and thank personnel. The Malaysian government is now saying that Mr Najib never stated that MH370 had crashed, but this is what most people construed from his unexpected statement on the evening of March 24. He said that, based on new analysis, Inmarsat and Britain’s Air Accident Investigation Bureau had concluded that MH370 flew along the southern corridor, and that its last position was in the middle of the Indian Ocean, west of Perth. “This is a remote location, far from any possible landing sites,” Mr Najib said. “It is therefore with deep sadness and regret that I must inform you that, according to this new data, flight MH370 ended in the southern Indian Ocean. Mr Hishammuddin also said yesterday that Mr Najib never said there were no survivors, but this is what was understood by distraught Chinese relatives in Beijing, several of whom were so distressed by the announcement that they were in a state of collapse. Malaysia Airlines chairman Mohammad Nor Mohmmad Yusof said himself on March 25 that the prime minister’s message was that “we must accept the painful reality that the aircraft is now lost and that none of the passengers or crew on board survived”. The airline sent rushed text messages to the same effect to relatives before Mr Najib’s announcement. They have defended this action, saying they were given only half an hour to inform nearly 1,000 people and wanted the relatives to hear the news from them rather than from the media. All the talk of crash or no crash may seem like semantics, not least as there is a massive international search for wreckage going on in one of the most remote areas of the planet. However, it must be bewildering and upsetting for relatives who have spent more than three weeks wondering what happened to MH370 and hoping and praying that their loved-ones are still alive. They have seen the search area shift from the South China Sea to the Malacca Strait and then to the southern Indian Ocean, and they have struggled to obtain clear, detailed information. On Sunday, 29 Chinese relatives of those on board MH370 flew from Beijing to Kuala Lumpur demanding proof of what happened to the missing plane. They say Malaysia has been too slow in releasing information, has made misleading statements, and is hiding something. They want an apology and they want to meet airline and government officials, and representatives of the aircraft manufacturer Boeing. On Sunday, they held up banners saying “Hand us the murderer”, “Tell us the truth” and “Give us our relatives back”. Mr Hishammuddin has given the families some slivers of hope. He has said several times that he doesn’t want to give them false hope, but, he says, as long as there is even a remote chance of a survivor, Malaysia will do whatever it takes. He keeps emphasising that there were passengers from 14 nationalities on the missing plane, but he accepts that 153 of them were Chinese, and emotions among the Chinese relatives have been running very high. Tomorrow, there will be a closed-door briefing for Chinese relatives in Kuala Lumpur. The meeting will be attended by technical experts from Malaysia, China and Australia , and will be broadcast live to families unable to attend. It is not just Chinese relatives, however, who feel the authorities are hiding something. Many Malaysians are sceptical and are not convinced that the missing plane crashed into the southern Indian Ocean. There is still a great deal of speculation about what happened. There are of course those who believe that the passengers and crew on MH370 are gone. In Malaysia, some of the messages about praying for the safe return of those on board have now been replaced by condolence messages, on Astro TV, for instance. After more than three weeks of searching, the mystery of flight MH370 remains as perplexing as ever. There are still more questions than answers and, for the relatives, this is torture. Seven countries are now involved in the search for wreckage about 1,900 kilometres from Perth. Today, ten planes and nine ships searched an area of about 120,000 square kilometres. 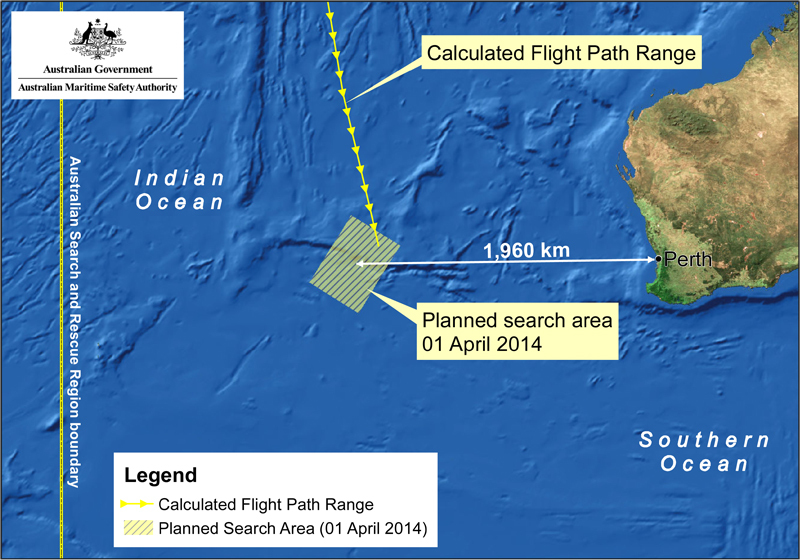 The search zone shifted again last week after experts refined their analysis of satellite pings and radar. It is now 1,100 kilometres northeast of the sectors being searched earlier. The most sophisticated reconnaissance aircraft have been scouring the seas for nearly two weeks, but despite several sightings and some recovery of debris, not one single piece of it has been linked to MH370. The search for wreckage is now a race against the clock as black box flight recorders usually have a 30-day battery life, and we are already on day 25. The Australian vessel Ocean Shield is now fitted with a towed pinger locator that can detect black boxes and the United States has also provided a Bluefin-21 autonomous underwater vehicle that uses sonar to scan the ocean floor. The Ocean Shield won’t reach the search area until April 3, however. There is no point in deploying the ping locator until searchers have found and identified actual debris. Even if the black boxes are found, only the final two hours of the cockpit conversations will be available. This means there will be no evidence of what was said in the cockpit at the time the plane disappeared. There would, however, be full flight data information. Retired Air Chief Marshal Angus Houston, who is in charge of the the new Joint Agency Coordination Centre (JACC) in Perth, said today that the current search and recovery operation was probably the most challenging one he had ever seen.